Jon Ossoff’s failure to put the Georgia special election away Tuesday could set him up for defeat in the June runoff, where he’ll face a seasoned Republican opponent riding a wave of momentum in a district Democrats haven’t held since the late 1970s. Republicans in Georgia and Washington, D.C., sounded increasingly confident Wednesday that the party would hold onto the seat after Ossoff — a 30-year-old Democrat and first-time candidate — finished first Tuesday but failed to win the 50 percent needed to avoid a June 20 runoff. “Republicans will definitely hold the seat,” GOP strategist Seth Weathers, who ran President Donald Trump’s campaign in Georgia last year, said Wednesday. Ossoff got 48.1 percent of the vote in an 18-person field — a better-than-expected finish, given he polled around 42 percent leading up to Tuesday’s vote. Republican Karen Handel, a former Georgia secretary of state, came in second with 19.8 percent, earning a spot in the two-way runoff against Ossoff. Now, it’s Handel’s race to lose, Weathers and other Georgia political watchers said. 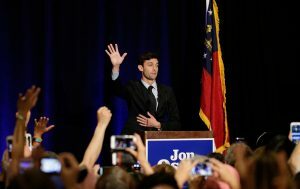 In a speech to supporters after the race was called early Wednesday, Ossoff said he remained confident despite failing to win the race outright. Both parties spun the results Wednesday, with Republicans saying the district would remain red, as it has for decades, and Democrats claiming Ossoff’s results prove the left could mobilize voters by opposing President Donald Trump and the GOP agenda. Democrats could keep the momentum going into the runoff. But it might not be easy, especially because the election will take place in the summer, when turnout will be lower for both candidates, said Andra Gillespie, a political science professor at Emory University. Lower turnout could harm Ossoff in a two-way race. “Ossoff’s challenge is to tap into latent Democratic voters,” Gillespie said. “He’s got to recognize that Handel is at the advantage, [and] recognize that there are limits to the number of Democratic voters” in the district. Republicans — including former House Speaker Newt Gingrich — have held the seat since 1979. Tom Price represented the district, which covers several suburbs north of Atlanta, until January, when he stepped down to lead the Department of Health and Human Services. Ossoff announced his candidacy as soon as the seat opened up, and the election quickly turned into a referendum on Trump, featuring 11 Republicans, five Democrats and two independents. Ossoff shot to the head of the field thanks to widespread energy on the left and a surprisingly strong fundraising effort. He raised $8.3 million, of which 95 percent came from donors outside of the district. The actor Samuel Jackson recorded an ad for Ossoff, and House Minority Leader Nancy Pelosi (D-Ca.) hosted a fundraising event for him in Washington, D.C.
On the other side, the Republican candidates had difficulty differentiating themselves, and several struggled in deciding how to run with Trump in the White House. 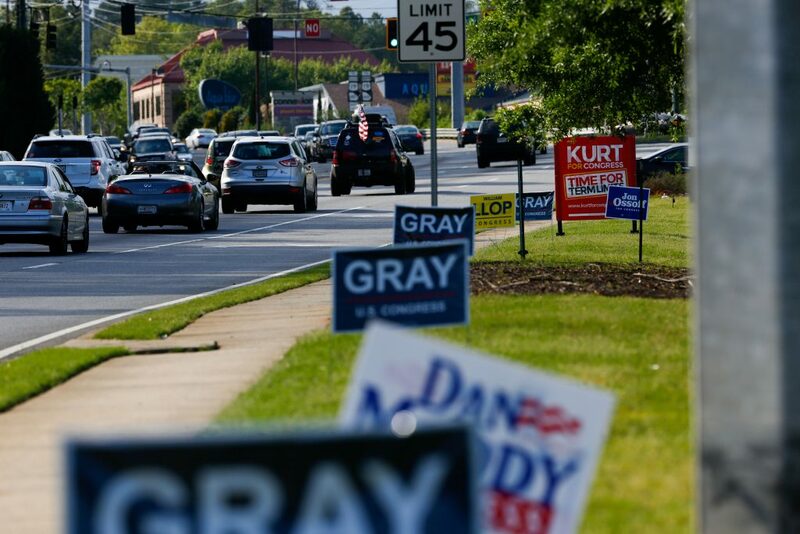 In the end, some of the GOP candidates who fully embraced Trump, like former Johns Creek Councilman Bob Gray, actually polled lower than predicted. Handel vocally supported Trump but was quick to draw distinctions between the president and her own brand of conservatism. Instead, Handel often invoked past Republicans who held the seat. The district “has a long legacy of Republican leadership,” Handel said Wednesday on CNN, citing her “good friend” Price, Sen. Johnny Isakson (R-Ga.) and Gingrich. Handel told CNN that Trump called to congratulate her on her second-place finish, and said she hoped he would travel to the district to campaign with her in the runoff. Trump stayed away during the special election; he won the district by just 1.5 points in 2016, a far cry from Republican Mitt Romney’s 23-point margin of victory over then-President Barack Obama four years earlier. Trump did not appear to give the race much attention until 48 hours before the polls closed, when he fired off a series of Tweets attacking Ossoff and urging Republicans in the district to vote. He also recorded a robocall that went out Tuesday. Georgia’s race came on the heels of a special election in Kansas where a Democrat also fell short in a district long held by Republicans. Democrats are now eyeing a special election in Montana next month, and another special election in South Carolina in June. The races are giving party leaders and voters an early lesson in what it takes to be a successful Democratic candidate in Trump country. The party needs to flip 24 seats to regain a majority in the House, and moderate suburban districts like the Georgia seat are must-wins for the party. As for Trump: White House Press Secretary Sean Spicer said at a news briefing Wednesday that he was ‘optimistic’ about the future of the party.